Meet Laurence Miller, born 25 Aug (taken from tombstone) between 1800-1827 depending on which census we use and who told the census taker his age being born somewhere in Bavaria. So we know nothing about his early days. We know from his naturalization that he left Bremen on or about the 15th day of September 1853 and arrived in New York Harbor on or about the 26th day of October 1853. 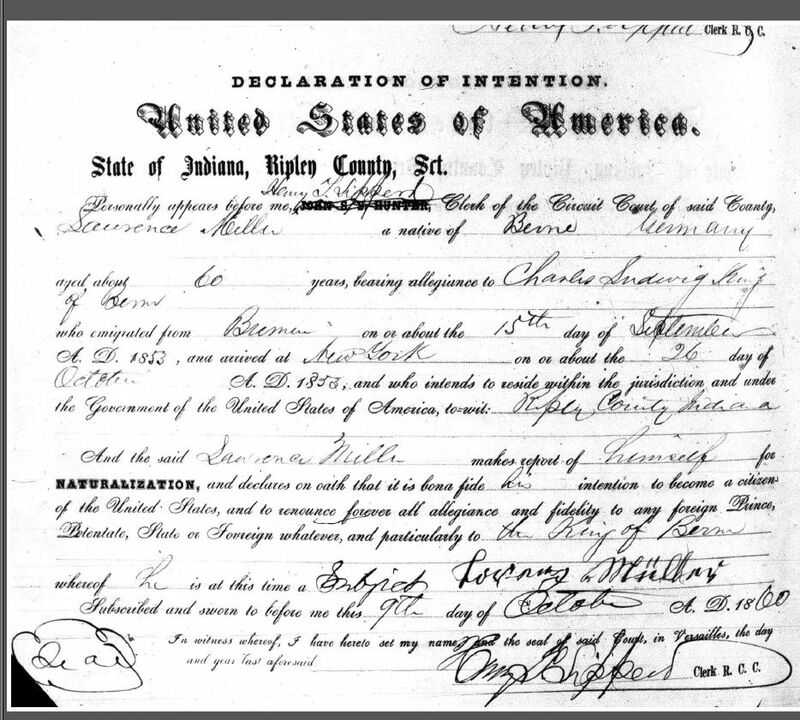 He gives his age as about 60 years when he states is the intention to become a citizen in October of 1860, so he is putting his year of birth about 1800. We now back up to his short time in Cincinnati in Hamilton County, Ohio, this is where he is found to be wed Christina Winter on 31 July 1854 at St John the Baptist Church, Cincinnati, Hamilton, Ohio. Their two oldest boys were born also born in Cincinnati. In 1860 Laurence and Christina are located on their farm on the Old Michigan Road in Otter Creek township, Ripley, Indiana. Laurence is age 32 a farmer and is from Bavaria and Christina is 24 and from Switzerland, John is 3 and William age 1 both born in Indiana. This we consider false since family lore tells us that Christina with two small boys came from Cincinnati via train and walked from the Dabney train stop with “Aunt Lizzie Salyers” to the farm. Lizzie Salyers doesn’t show up in the family, in the 1870 census there is an Elizabeth Salyers living a few farms away age 28, so she would have been 18 or younger when she met Christina for the walk from the depot, or an old friend from the old country? We can only speculate until proven otherwise. Things have changed slightly in 1870, the census shows us the family still in Otter Creek, Lorenzo Miller is 40, a farmer, Christina 38 from Switzerland, John 14 born in Ohio, William 11, Eva 8, Henry 5, Lorenzo 2 all born in Indiana and mother in law Mary Winter 68 from Switzerland. It is not known who supplied the information on ages in this census, it does make one wonder tho’ because of the age discrepancy of both Laurence and Christina. In the 1880 census the family is still on the farm. Lawrence is age 58 still from Bavaria, Christina 48 from Switzerland, John 23 is a farmer, William 20 works on farm, Eva R 18, Henary (this is how it was spelt in this census) age 16 and Laurence 12 both work on farm and attend school, George 8 goes to school and Albert age 1. What the census does not show us is the two boys, Jacob born 1873 and Joseph born 1877 both dying before Mary Winter is still residing with the family, listed as mother in law and was born in Switzerland. Mary has Consumption and is 86. Again the ages are off for Lawrence and Christina. So who is giving the census taker the information? Before Laurence dies, he has three more children with Christina; they were Albert b 1882, Alexander b 1885 and Mary b 1887. Laurence dies on 8 Jun 1888 as was buried in the St Magdalene Parish burial ground in St. Magdalene, Ripley County which is now in the Jefferson Proving Ground Indiana. 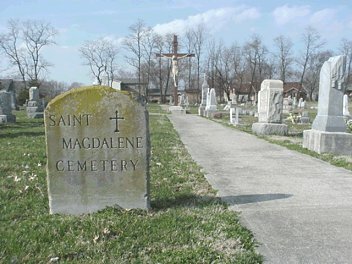 The Cemetery is now just marked with a cross, most of the burials were removed and the Millers were relocated to St. Patrick’s Cemetery in North Madison, Jefferson, Indiana. Laurence and Christina gravestone is very weathered. I will look out a copy of it. We have photos of all the living children and Christina but nothing on Laurence. If you have a photo of Laurence Sr and would love to share it, I would be grateful. Anyone have any clues on how to find births in 1800-1830 Bavaria? Or do they have a list of emigrants leaving the country? I have not found any references to either of these questions but would love help. Please leave comments to ideas on how to find Lorenz Müller in Berne. This is a brick wall that DNA studies still have been able to help. This entry was posted in Elusive Ancestor Hunter and tagged Bavaria, Berne, Christina Winter, Cincinnati, DNA, Hamilton, Immigration, Laurence Miller, Lorenz Müller, Ohio, Otter Creek Ripley County Indiana, St John the Baptist Cincinnati Ohio. Bookmark the permalink.